How did Marie Kondo get into tidying up? Aged five, she started reading all her mum's home and lifestyle magazines (we love her already). At 15, she really got into tidying, reading every book she could find on the subject. She then began tidying every room in her home (read that and weep, parents of teenagers), then started tidying her friends' homes, then her classroom. At 19, she because a professional organising consultant, giving lessons in clients' homes, but soon had a six month waiting list, at which point she decided to start writing, which lead to YouTube tutorials and, of course, her Netflix series, Tidying Up With Marie Kondo. Now, she's being featured on Realhomes.com. Things surely can't get any better. Marie Kondo's KonMari method of tidying up has swept the Realhomes.com office like a neat-freak tidal wave: we've watched her series on Netflix, we've bought her books and we've got stuck in ourselves at home. Her tidying and decluttering method isn't as drastic as some screaming headlines would have you believe. Think Monica from Friends but more so. It all makes perfect sense, it's all really doable, and it should make even the most dedicated of hoarders have a rethink. So, if you're feeling the itch to learn how to declutter like Marie Kondo, without spending hours researching her method, you'll love this handy, straight-to-the-point beginner's guide so you can get your home organised this weekend (or next, if you're not quite ready to feel the joy. We've approached Marie's KonMari method in a way that makes sense to us – and therefore hopefully to you. Within each 'rule', there are lots of extra tips and tricks to be had. We'll be bringing you more of these over the next weeks, but you can check them out on Marie's YouTube channel and in her books, too (see below). What are the basic rules of the KonMari method? 1. Commit to tidying up (in other words, set aside some time to do that and nothing else). 2. Imagine your ideal lifestyle – or, picture your home not as it is in the 'before' but as an 'after'. 3. Don't start tidying before you've finished discarding. 4. Tidy by category not location – more on this later. 5. Follow the right order – ditto. 6. Ask yourself, does this item 'spark joy'? 7. Thank your home – it gives you shelter, after all. Start by emptying your cupboards/wardrobes/drawers by category. So, if you're tidying up and decluttering your kitchen, you might get all the food out at once and put it back before you start on all the china and cookware. If you're working on your bedroom, you might get all your clothes and shoes out of your wardrobes and totally reorganise, declutter and put back before you start on your makeup drawer, for example. Fifteen out of date travel guides on your living room bookshelves? The charity shops will love 'em. Kids' rooms? Start perhaps with all the toys before you begin on clothes... and so on. Emptying all the items by category at once allows you to see just how much stuff you've got in that category. And, if you're an owner of 25 identical belts, you can thin them down and only keep the best ones. Perhaps you've ended up with 10 extra tins of supermarket brand baked beans (shudder) that will never get eaten? Send them to the food bank. Sorting by category will allow you to identify gaps, too. No brown belts? Sell 10 of the black belts online and buy yourself a nice brown one with the proceeds. You get the drift. Take a deep breath. It'll stop you feeling somewhat panicky about the piles of clutter? Just stick to working by category. Getting distracted from the category you're working on is where disaster lies. Stick to your plan, set aside enough time to complete that category before doing much else and recognise that you will get there (working on a day when the weather is crappy, you've got nothing much else on, and fuelling yourself with regular cuppas and something soothing on the radio will all help, if you want our advice). You've probably heard this term being bandied about and, if you're a Brit (we can't vouch for other nationalities, let us know), you might well have rolled your eyes. BUT, translated for cynical British humour it means: do you like it, will you wear/eat/display it, and if not bin it. It makes sorting the clutter sooo much quicker if you can be really honest and ruthless. You can always have a 'not sure' pile that you can go through again at the end if you're wavering (this is our rule, not Marie's but we think she'd be sympathetic). Traditionally, we tend to put like with like when we're tidying up – all the tea towels in one drawer, all the knives and forks in another. Makes sense. But what about when you get into a less defined area. Let's talk toys, for example (but it could be makeup, hair accessories, batteries, dry foods...). It would mean finding a place for all those board game boxes; another for all the Lego; another for all those tiny little Sylvanians; another for those random, tiny bits and pieces that are unidentified but probably belong somewhere that every child's room holds. Marie Kondo says that items with similar uses and of similar sizes should go together and that by doing so nothing, even the tiniest of your possessions, ever gets lost and always has a place. Ideally, she says to keep the smallest of items in drawers. Failing that, in sub-divided boxes, like those shown below. Marie Kondo says that it's wise to have items that you use frequently within easy reach; anything you use infrequently can be stored in difficult-to-reach areas. Marie says that storing everything by category will mean that: nothing gets left out, making the house untidy; and you know where to find everything because it's got its own designated space. Think about your loft space/garage/basement/toy cupboards/and so on... are they packed with cardboard boxes of stuff that may (or likely not) be labelled, that can't be neatly piled one on the other, and that are opaque so that you're never quite sure where anything is and that finding one item might mean going through every single box? Marie Kondo's decluttering and tidying up method advises using clear boxes. You can quickly see what's in the boxes without even moving them or taking the lids off and, bought as a set, they'll pile neatly, and safely. Lidded plastic boxes will help keep your items dry, too. We have got literally tons of storage ideas for your home, but check out some of our favourite storage buys below. Marie Kondo's books, The Life-Changing Magic of Tidying: A simple, effective way to banish clutter forever and Spark Joy are available on Amazon. If you're decluttering your wardrobe, it's worth learning how to fold your clothes like Marie Kondo (see our guide for an easy to follow step by step). 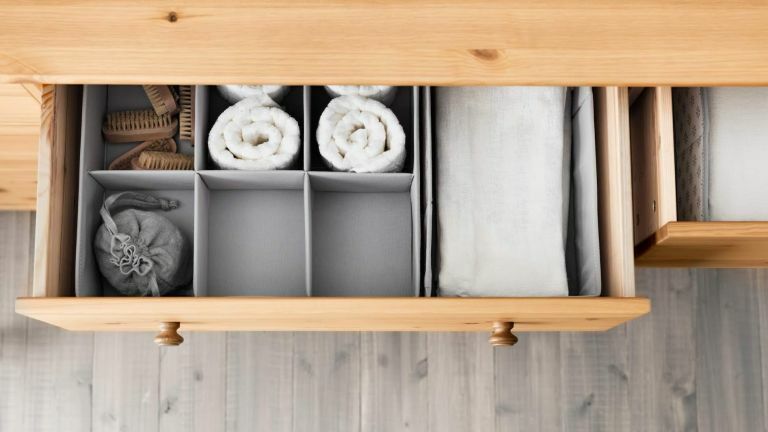 It lets you see everything in your drawer or in storage boxes at a glance, from socks to T-shirts, it's a space-saving drawer-tidying method, and it makes clothes easy to grab without upsetting the entire drawer. Try it, you'll love it. And don't miss more of our tips about how to declutter your wardrobe (it's a must-read if you're really struggling with throwing out that sweater). Marie Kondo says that every morning she likes to open the windows to let the old air out and new, fresher air in. It gives her home what she calls a 'purified environment' and is all about improving our overall well-being. Opening windows to declutter it of old air: how hard can that be?